Dentist Said I’m Too Old for Dental Implants? I’m a little distressed and hoping my dentist is mistaken. He’s been my dentist for years, but sometimes I get the impression he doesn’t exactly “keep up” with the developments in his field. I’ve had dentures for 25 years. Back then I’d never even heard about dental implants. My dentures never really looked natural, but it’s getting impossible to keep them in even though I completely replaced them a few years ago. To top it off, now my face is smushing around them. I asked my dentist about dental implants and all he said was, “Not at your age.” I’m sick of dentures. Is there any way for a mature woman to get implants? I’m sorry your dentist gave you the impression that your age would preclude you from getting dental implants. If you’re in good health otherwise, there isn’t really a reason why you can’t have them. Though, the length of time you’ve had dentures will require you to have another procedure done ahead of time in order to make them viable. When your teeth were removed, your body started reabsorbing the minerals in your jawbone to use elsewhere throughout your body. While great for other aspects of your body, it’s a horror for your jawbone. This is why your dentures no longer fit and why your face has scrunched up around them. This is known as facial collapse. Fortunately, there’s an easy solution to that bone loss. Bone grafting can now be done as a one-day procedure. 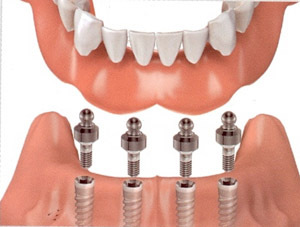 Once you have enough jawbone again, you’ll be good to go to get dental implants. The best part is, with implants in your jaw, you won’t have to worry about losing any more jawbone. Now, I want you to know your dentures could have been made to look beautiful and natural, though you’d still have the same problem with the bone loss. What the dentures look like is really down to the cosmetic abilities of the dentist. It sounds like your dentist isn’t very artistic. Unfortunately, you won’t get any better results from him next time, unless he’s done extensive training since then. If you want a beautiful smile, you need to find a different dentist to do these implants. Who Should Do Your Dental Implants? There are two things which need to factor into who you go to for this procedure. 1. Technical skill. They’ll need extensive training in the implant procedure. You want to make sure they’ve done post-graduate training. 2. Cosmetic Ability. If they get the implants right, that’s great, but you won’t like your smile much if he doesn’t make the implant crowns beautiful. The most artistic dentists are AACD accredited. In fact, many of them have a beautiful smile guarantee. I have severe bruxism and maloclussion. As a result my teeth have been ground practically down to nubs, though otherwise healthy. My dentist hasn’t done much to help me with this, except give me a mouthguard. However, the condition of my mouth really bothers me. Is it best for me just to pull them all and get dentures? I want a normal looking smile, where it is easy for me to eat. It’s a shame I’m dealing with this at 40 years old. Bear in mind everything I am saying is without having examined you myself. This would have been easier to treat in the beginning. If you’ve known about the TMJ issues, have you been to a TMJ dentist? I’d be hardpressed to call them a competent one if all they did was give you a mouthguard. I don’t think dentures at 40 is a good idea. 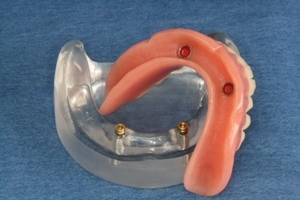 In 10 to 20 years you’ll be dealing with facial collapse and won’t even be able to wear your dentures anymore. Even without that serious issue, rarely do denture patients feel like they have an “easy” way to eat. It is always ideal to save your own teeth when possible. As you’ve said yours are otherwise healthy, though worn down, you might consider getting a full set of porcelain crowns. However, you must go to an experienced, well trained TMJ dentist. There are so many factors to consider when doing a case of your magnitude. If you ever do get to the point when you do have to remove your teeth, than I recommend you get dental implants instead of dentures. That will protect your from getting facial collapse, and you’ll be able to eat normally.